Mittens are a necessity for most kids' wardrobes, and these cute basics are so easy you'll spend more time fighting your kids to wear them than you did knitting them! These patterns are easy to embellish with small embroidery designs. They're sized for toddlers and bigger kids, but they're really easy to customize, too. If you're worried about the sizing, take measurements for the intended child's wrist and hand circumference and hand and thumb length. To fit a toddler or small child, the average wrist measurement is around five and a half inches (but will stretch), with a hand length of four inches. The gauge of this project should be 20 stitches and 32 rounds per four inches (five stitches and eight rounds per inch) in stockinette stitch in the round. Cast on 30 stitches, distribute on three double-pointed needles and join in the round. Work in knit one, purl one ribbing for two inches. Work two rounds in stockinette stitch (knit every round). Knit 15, make one, knit 15. 31 stitches. K15, M1, k1, M1, k15. 33 stitches. K16, M1, k1, M1, k16. 35 stitches. K17, M1, k1, M1, K17. 37 stitches. Work in stockinette without further increasing to 1.5 inches from beginning of stockinette section. Work even for 1.5 inches. K1,ssk, k9, k2tog, k2, k2tog, k9, ssk, k1. K1, ssk, k7, k2tog, k2, k2tog, k7, ssk, k1. Decrease as established every round until 10 stitches remain for both sizes. With a new needle, pick up and knit one stitch at the beginning of the held thumb stitches. Knit across seven held stitches (you'll want to divide these stitches onto two needles) and pick up and knit one stitch on the other side. Nine stitches. Knit in rounds for 1.5 inches. Nine stitches. K4, k2tog, k3. Cut yarn, leaving a long tail. Thread onto yarn needle, slip remaining stitches onto yarn and pull tight. 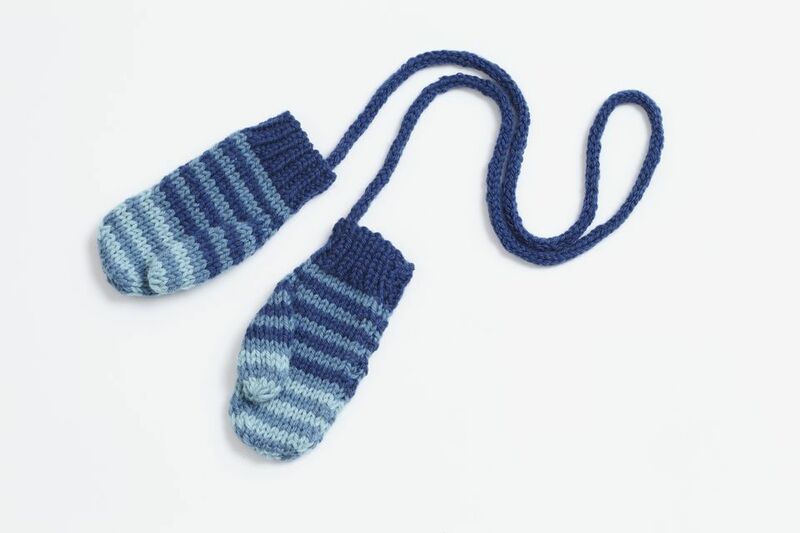 Knit the second mitten in the same manner. If desired, embellish with embroidery, a duplicate stitch motif or another embellishment of your choosing.